When Jason and Courtney found their 1930s home in 2013, they moved quickly. 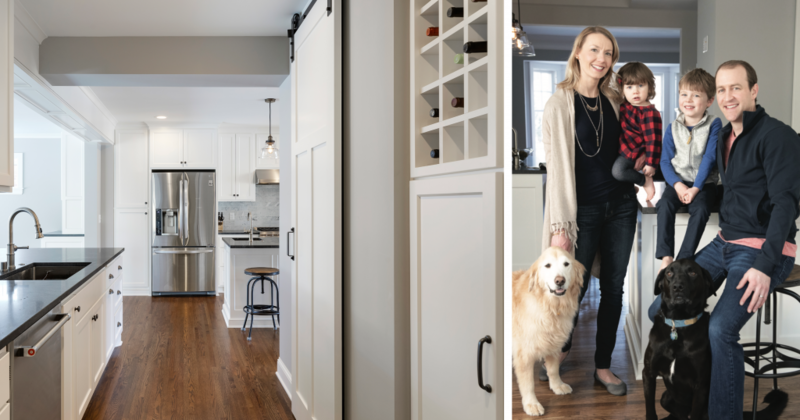 With two big dogs, Ollie and Remy, and their ﬁrst child on the way, they knew it was time to move from their first home to a place with a larger ﬂoor plan. A few steps from Cedar Lake, they found a home that had the layout they were looking for, was in a great location and was on a large lot—so they jumped on the property. “We figured it had the potential for us to do something in the future, so it would work for us at the time,” explains Jason. As the years went on, the galley kitchen became a source of frustration for the family. It was wedged between the family room and dining room and made entertaining difficult. The ﬂow felt disjointed and closed off. “We spent a lot of time in there bumping into each other and tripping over the dogs,” says Jason. They started reaching out to a few remodelers but put a pause on their project when they found out they were expecting their second child. Things picked back up in November 2017 when they went to a party at a friend’s home and noticed it had been completely transformed. “We had been there several months before that, and when I walked in everything was different,” explains Jason. 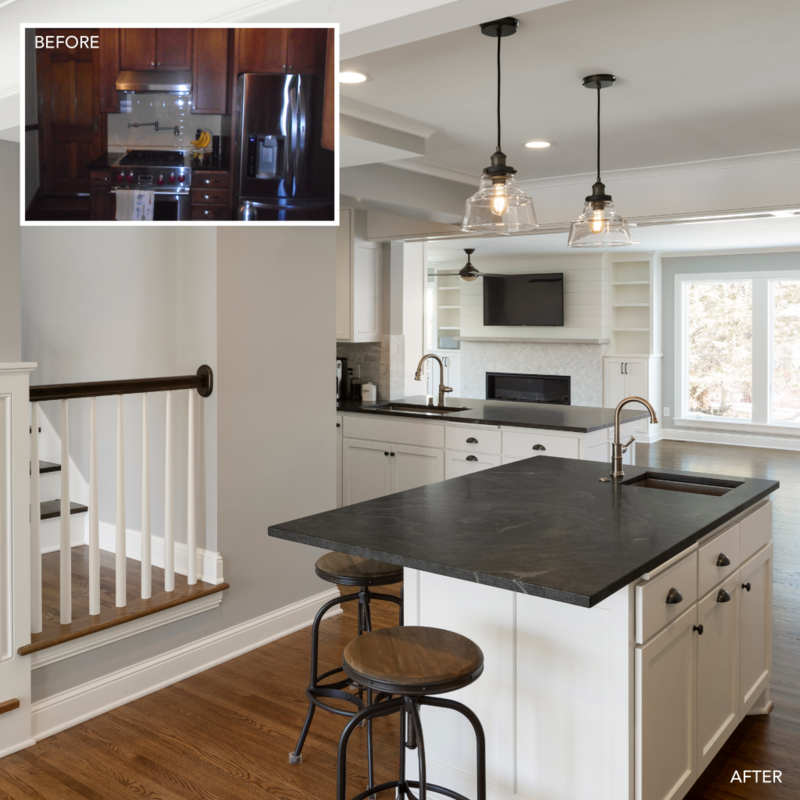 The friends had just finished a remodel with Lecy Bros. Homes & Remodeling, and their positive experience convinced Jason and Courtney to reach out and get things rolling. Storage was key for Courtney, who made sure there was plenty of cabinet space and shelving for children’s toys in the design. A new set of lockers in the mudroom will be the perfect drop station for the children as they get older, and the refreshed layout made space for a main-ﬂoor laundry room. Other than the new ﬂow and the need for increased storage, the family didn’t have a strong sense of the finishes and design they were looking for. Lecy Bros. presented ﬁve different design options for the family to choose from, explains Courtney. “The designer at Lecy Bros. was very good about helping guide us and kept us in bounds with what we wanted the place to look like,” says Jason. 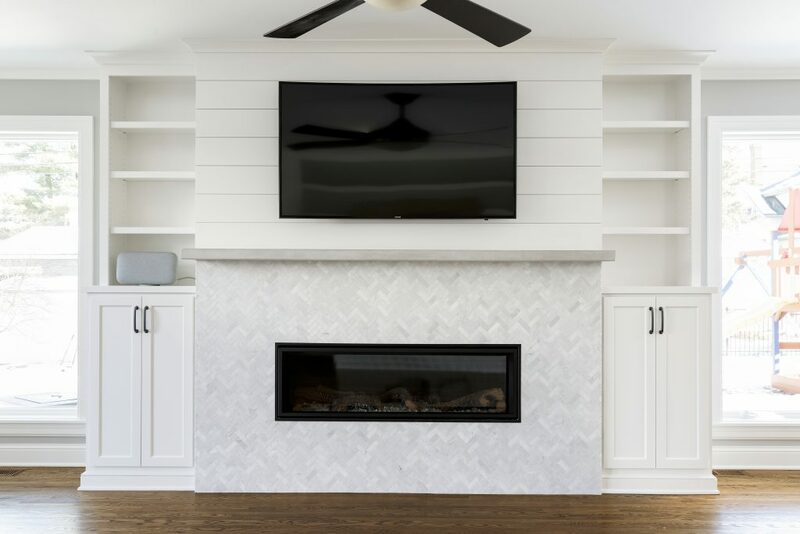 The design bumped out the back of the family room to square off the house, and a wall blocking off the kitchen was removed and replaced with a beam to provide better sightlines to a new gas ﬁreplace. Plus, the main-level bathroom which “felt like an airplane bathroom,” was brought into the 21st century. The vintage charm of the original home was retained by replicating the molding and oak wood ﬂoors in the new spaces, all while opening the ﬂoor plan and blending in transitional design. A new patio with sliders gives Ollie and Remy easy access to the backyard and provides the family with a place to relax and enjoy summer evenings. The entire process took four months. During that time the family set up in the basement—which their two children loved. But when the time came to move back to the main floor, they were all more than ready. Now, they find themselves enjoying their weekend mornings sipping coffee at the peninsula while listening to NPR, and spending their evenings building Legos with their son in front of the fireplace. Their young daughter loves sitting up at the new counter where she can be right at eye level with her parents. Plus, the improved flow left lots of great space for family dance parties. “It’s really upgraded our day-to-day,” says Jason. Photos by Spacecrafting and Scott Amundson Photography. 7 design ideas that add “wow” to indoor and outdoor spaces. Rob and Tamara found the “up north” feeling they were looking for on their wooded lot in Bloomington.